Spring has sprung, and for Cody, Wyo., Lodge No. 1611 that can only mean one thing—baseball season! 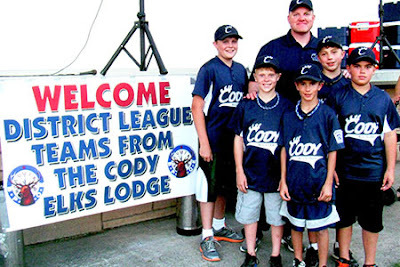 The Cody Elks know that playing sports is beneficial—it offers youth an opportunity to exercise and learn good sportsmanship. To support the local little league team, the Elks used an Elks National Foundation Promise Grant to hold a barbeque for the athletes and their families. Forget the peanuts and crackerjack. Elks prepared a picnic lunch for more than 600 guests, providing athletes with good food and good company after working hard on the baseball field. To endorse good health even after baseball season ends, the Cody Elks promoted the Lodge’s soccer shoot at the barbeque.